In a large sauce pan, melt butter. In a large pot, bring chicken broth to a boil and keep at a simmer until ready to use. Add rice to melted butter and cook, stirring frequently, until rice becomes a chalky color toward the center, about 5 minutes. Add wine and continue stirring until the liquid is absorbed. Add salt and pepper to taste. Add about 1 cup of the simmering broth to rice and stir continuously until broth is absorbed. Once it is completely absorbed, add another cup and continue in this manner until rice is cooked but not mushy. It should have a creamy consistency yet still be firm to tooth (al dente). Remove from heat and stir in grated cheese. Let cool and refrigerate for 4-6 hours. Use 8 oz. scoop to form cooled risotto balls, insert Fontina cheese in the middle and mold the ball into a circular shape. Mix bread crumbs and seasoning into bowl. Insert risotto ball into breadcrumb mix, coating outside. Place risotto ball into fry oil and heat till there is a strong golden color and inside cheese is melted. In separate pot heat up Pompilio’s Marinara Classico sauce to 140 degrees. 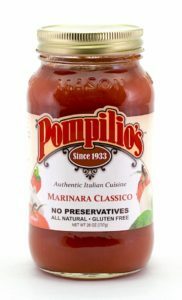 Serve risotto balls with Pompilio’s Marinara Classico on the side for dipping.